Not sure where to start with Instagram Stories for Business? You’ve heard it gets attention. You’ve heard it gets engagement. But how do you get started? What is the best type of post to make? 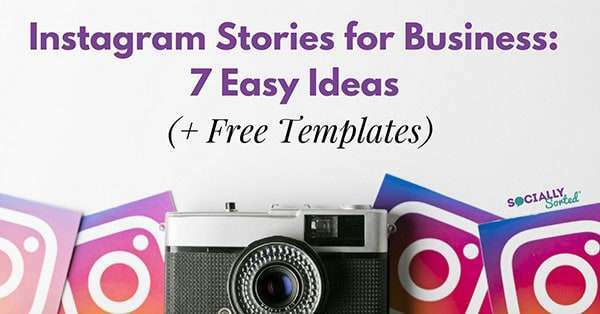 In this post I share 7 Easy Ideas for Instagram Stories (and some free templates). Instagram Stories is getting better and better. It’s just reached 250 million monthly users and is not showing any signs of slowing down. 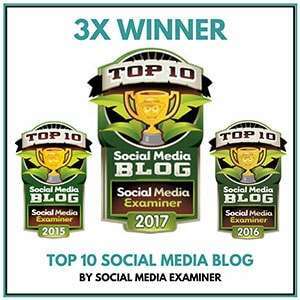 It’s an engaging way to connect with your audience and (so far) an easy way for them to see your content. I wrote about some of the features here in this post about Instagram Engagement. Instagram Stories also feature high up on the newsfeed, so the chances are (while not everyone is making stories) you’ll get seen. Your followers are more likely to see your post in stories before they see your actual newsfeed post – so there are plenty of opportunities to be creative with it. So let’s jump in and take a look at some savvy ideas from savvy brands using Instagram Stories for Business. 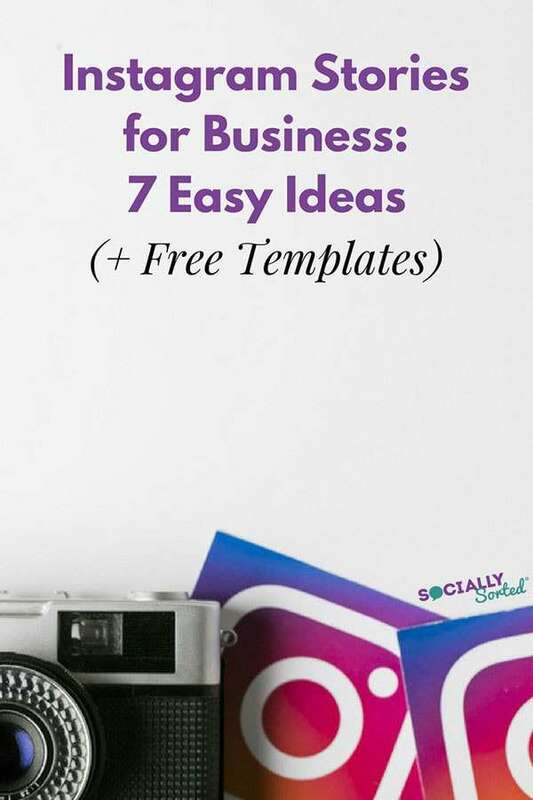 I’ve included tips for how you can apply these ideas to your own business … and some awesome templates you can try right now to stand out from the crowd on Instagram Stories (scroll to the bottom if you can’t wait). If you are not savvy with a camera yet or not sure what to share, then announcing news can be a great strategy. One company that does this very well is Social Bakers. Social Bakers have created a series of templates that they can use for different news about each social platform. Then it’s a matter of simply editing them with the latest news and getting it up into Instagram Stories quickly. News breaks in the marketing industry? Social Bakers are all over it. How can you apply this to using Instagram Stories for Business? 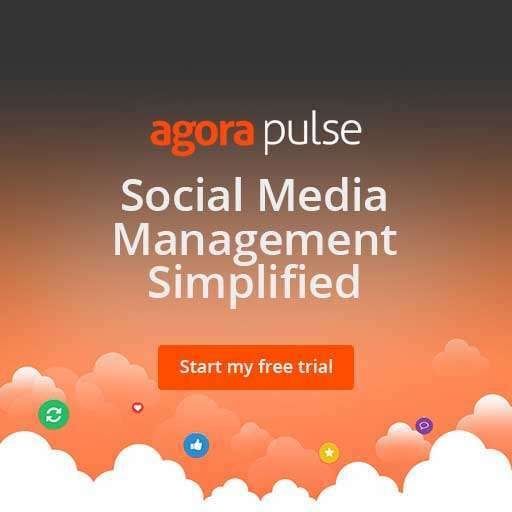 Use a similar approach to Social Bakers. Set up a template for news and have it ready to edit quickly and then upload into Instagram stories. Take a screenshot of the news from another source and upload it into Instagram Stories. If you are confident on camera, go face-to-camera and announce the news in a short video! If you need to talk for longer than 15 seconds at a time, use the Storeo App (iPhone only) to record a longer video then chop it into 15 second snippets to upload into Instagram Stories. 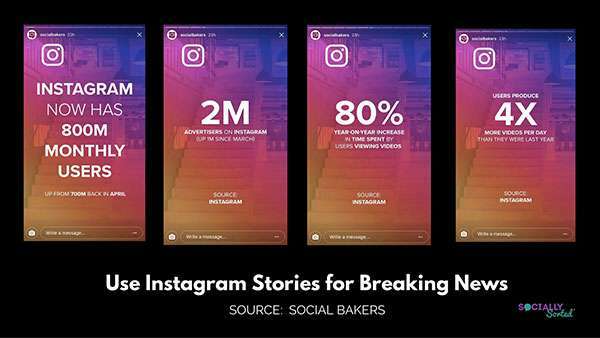 Trust me, it’s likely that not many other people in your industry will be using Instagram Stories this way. You can also add a post on your regular Instagram feed and direct people back to your story for more information. Either works! If you have a new product coming out or something you are launching, Instagram Stories is a great place to introduce it. You can even start talking about your product while still in the development stage! Chocolate Johnny did this with a secret project he is working on at Perfection Chocolates. He teased the new chocolate product on video, and added a sticker with the hashtag #NewAgeChocolate (gah!). Then he asked who would like to try it…. I’d love to tell you what it is… but apparently it’s top secret. 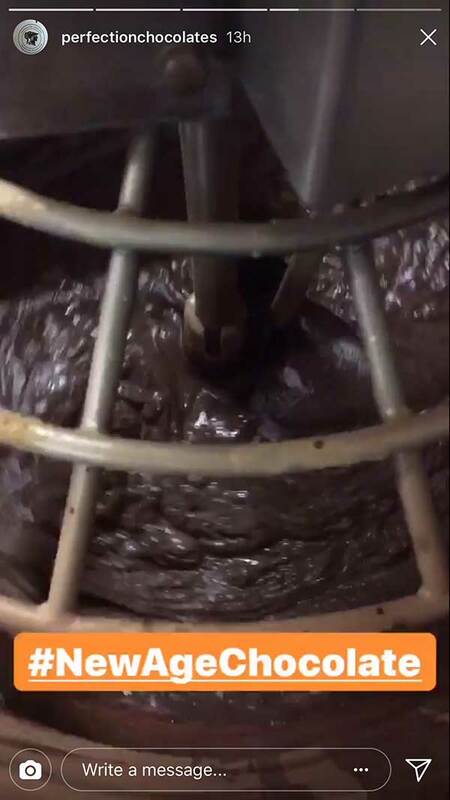 Let’s hope we find out soon…because… chocolate. Chocolate Johnny added a poll as well, so that his viewers could engage. This type of poll can be used to find out more about your target market for a product… before you even release it. Although… I am sure Johnny knew he would get a positive response! Don’t wait till your product is released – use a poll to engage with your audience along the way. Do mini-market research polls – you can find out about potential products before they are even launched. Engage with your followers in the development stage to get feedback. 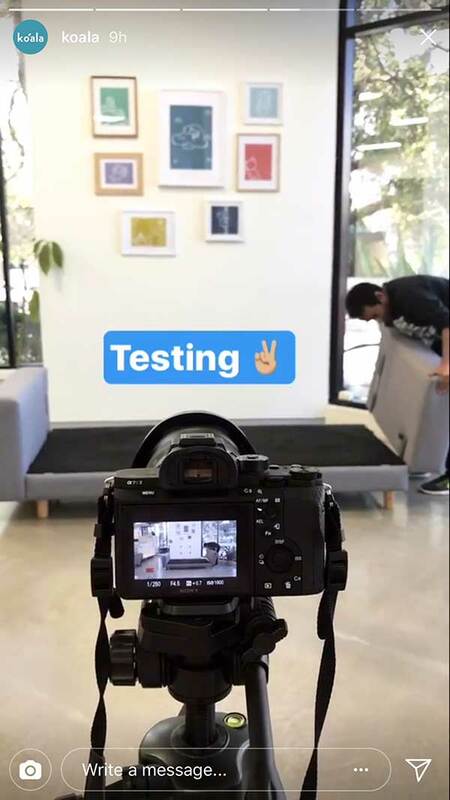 Use video to document your behind the scenes regularly in the lead up to the launch – your followers love to feel like they are getting a sneak-peek! 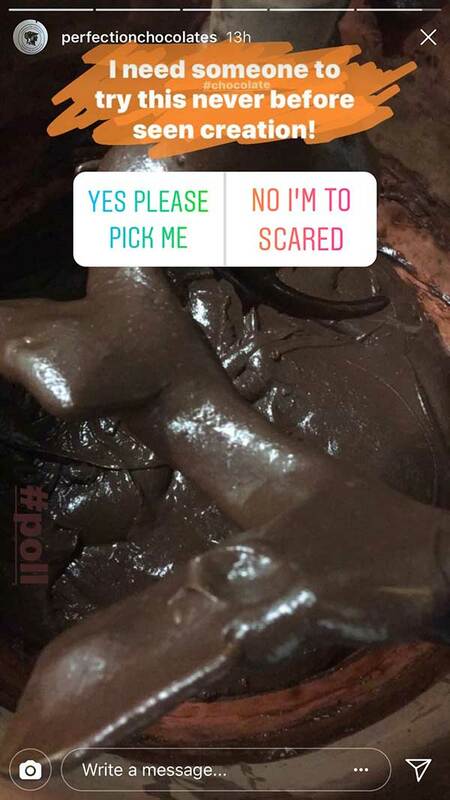 Speaking of Poll, they are one of the newest feature on Instagram Stories. 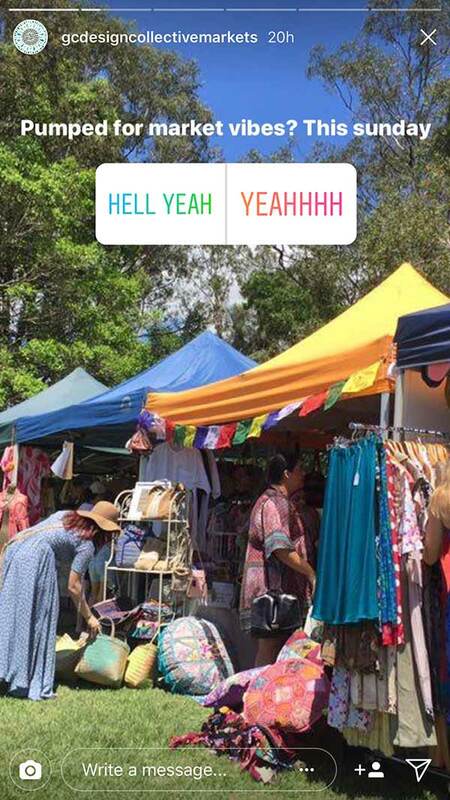 Polls are a great option for you to use Instagram Stories for business and really connect with your target audience. They can be used as a bit of fun, or you can use them to get some serious data from your followers. Open up Stickers (choose the smiley face icon at the top of the screen). Choose the Poll sticker feature. Add your question (you can ask one question). Edit the Poll responses – you can have two possible responses. The default is Yes/No but you change it to whatever you like, as long as it is a relatively short phrase for each. Polls are not anonymous in that the creator of the poll can see what your response is and who you are. Keep this in mind as the poll creator and responder. Add the poll to a video if you can. Followers will then get 15 seconds to read and respond. It can be a bit quick if they are on a photo. You can press the screen to pause the story, but not all your viewers may realise that, so give them the maximum time to respond if you can. In the example above, Amy’s poll might give her some really useful information beyond engagement. Hypothetically, she sees that someone responds and hasn’t read her book. That person might host/own an event, podcast or blog she wants to connect with. She could choose to connect with them and send a book to them. Use the poll as the start of a conversation. Follow up with and engage with people that respond, especially those that you identify as being ideal customers….even if it is just to engage with their content. Get creative with your poll responses – you don’t have to just use Yes/No. Use polls to get feedback on ideas, ask your followers for input, involve them in what you are doing behind the scenes. Don’t over-use polls. Currently they are a fun feature but one that shouldn’t be overdone. Reserve them for when you really have a question you want to ask! If you are adding a poll, only add the poll… no other stickers or content that will result in your post being too busy. People can’t cope with doing two things at once! A great way to use Instagram Stories is to showcase your team! I couldn’t resist showing you this example. Now I know you may think “but woah.. I don’t have a team member that is THAT interesting” and yes, sharing a team member that works on the top of a giant wind turbine is pretty massive… and very clever. But there is a reason why I am using GE as this example. She was referring to the fact that GE showcases a lot of their team, the 1000s of employees tasked with making the world turn through industrial innovation. They tell their stories in fun and creative ways. 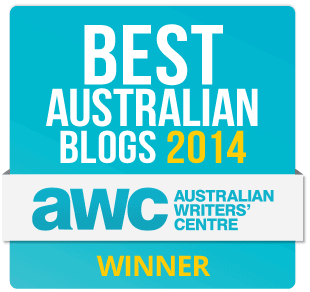 They believe that stories are right under our noses – we just have to tell them in a way that is relatable and human. So with that in mind, share your team – we want to meet them! 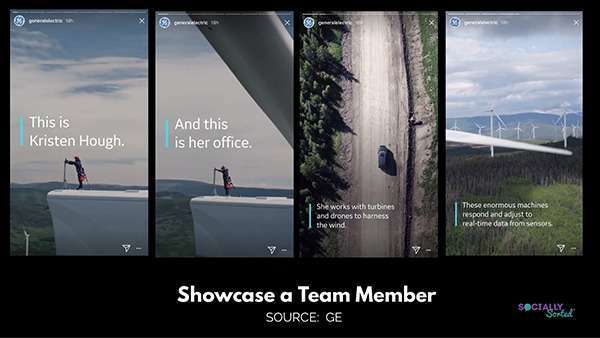 If GE can do it in creative ways (with often seemingly boring content) then so can you! Feature a team member of the week – either by photo or even better by video! Interview a team member. Many team members have knowledge in them! You just need to tease it out for Instagram Stories. Ask them questions or get them to give 5 tips about a topic that will help your followers. Don’t underestimate how interested we are. You might think that the job your team does is not interesting. Sure, you might not have a Kristen who works on top of wind turbines… but I can guarantee you that your team is interesting. Humans are interesting. If your team member is camera shy, get them to turn the camera away and take us on a tour or use audio only. You can also interview them off camera and add their tips or answers as images. Get creative! As I mentioned above, Instagram Stories are often shown to your followers first if they are at the top of their feed. They may see them before your regular posts. HOT TIP: If you have over 10,000 followers you can use the SWIPE UP function to add a link to your story (any website link). Unfortunately this is only currently available to users with 10,000 followers or if you have a Verified Account (usually reserved for personalities and large organisations, charities or tourism bodies). Give a Call to action to read your blog post, video or podcast – If you have a new piece of content coming out, be sure to announce it in Instagram Stories. Even just a single image like the one you see above can be enough. If you don’t have the Story Link Feature (over 10,000 followers or verified account) then you can use a video and announce a short link. You can also direct people to your link in bio or any other link that you can add to the screen. Even say it verbally on video. Just because you don’t have a story link feature doesn’t mean you can’t share your new content. Share some of the content – Rather than just saying “read my new blog post” and sending people away from Instagram, share something extra in your story first. It might be one of the tips or perhaps a summary of the post. It’s always best if you can give value ON Instagram. People will love and trust you for it and will be more likely to click out of Instagram to read your content. There’s one thing about us humans. We love to be a fly on the wall, to get a sneak peek and to generally be in other people’s business. And when it comes to Instagram Stories for Business it’s no different – we want to go behind the scenes. Instagram Stories is PERFECT for that. And with so many options with video and images and text you have a huge number of ways to do it. Koala Mattress Company in Australia do a GREAT job with behind the scenes, taking us on a journey throughout their day in the life of the company… including team yoga! And I love this example too, from Mount Macedon Winery who regularly go behind the scenes to show what they are working on with their wine. Or, this case showing the (very!) fresh produce that goes into the lunches in the restaurant! Have your camera at the ready throughout the day! Take video or photos to document your day and ask your staff to do the same. Instagram only allows you to post photos from the past 24 hours into Stories, but here’s a hack: If you have old photos that you think would make great content, screenshot them. This brings them to the end of your camera roll so you can access them from Instagram Stories. If you are stuck for ideas, check out the HOT templates I mention below! 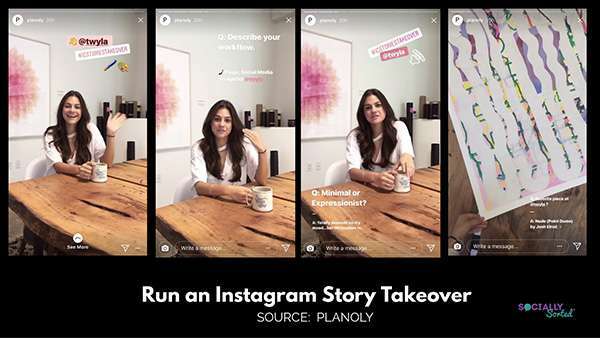 As you get confident with Instagram Stories, a fun (and effective) activity can be to run an Instagram Stories Takeover with someone from your industry, a business you collaborate with or an influencer. When you run a takeover, that person basically posts on your behalf on your account. You would normally arrange for them to pre-create the content via images or video and your team uploads them (to avoid handing over passwords etc. However, it’s up to you how you handle it. 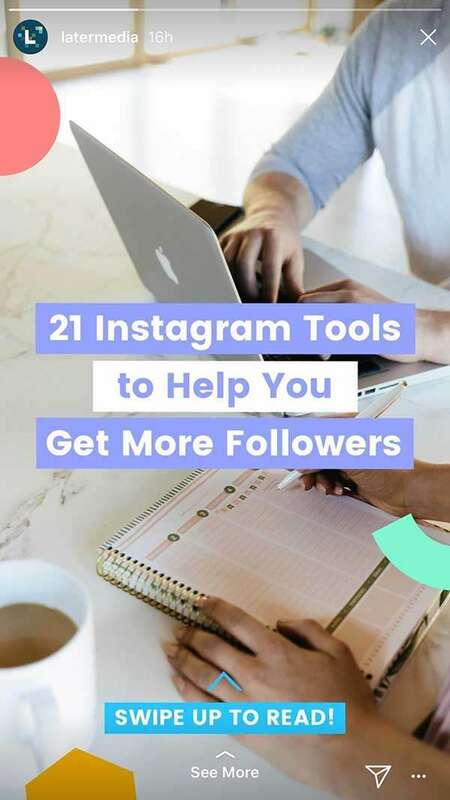 You can get tips for setting up an Instagram Story Takeover in this post. 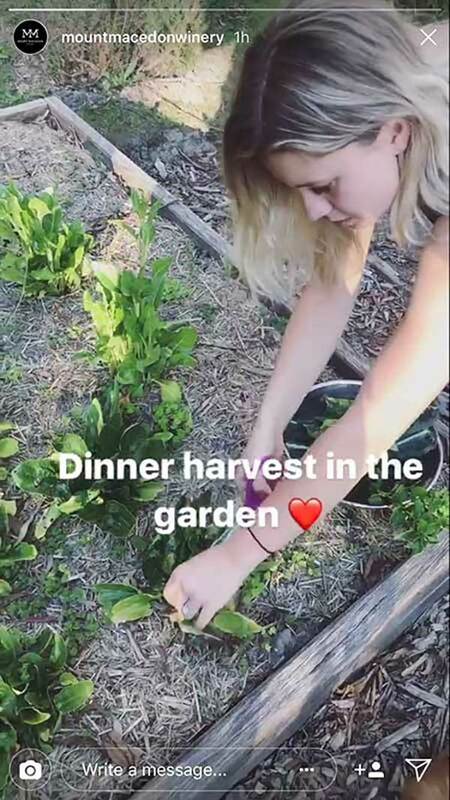 Her’s an example of an Instagram Story Takeover of the Planoly Account. Planoly was “taken over” by Paige, a Social Media Strategist at Twyla. Planoly is a tool for planning, scheduling and engaging with your Instagram feed, and Twyla is company that sells museum-quality limited edition prints online. A nice match! Both companies have similar size audiences so it is a good way for both audiences to discover each other! As you can see above, Paige introduces herself and then answers some questions in the takeover, sharing her favourite art from the Twyla collection. In this example they use video (which is a great way to engage with the audience) but you can also use still photos. 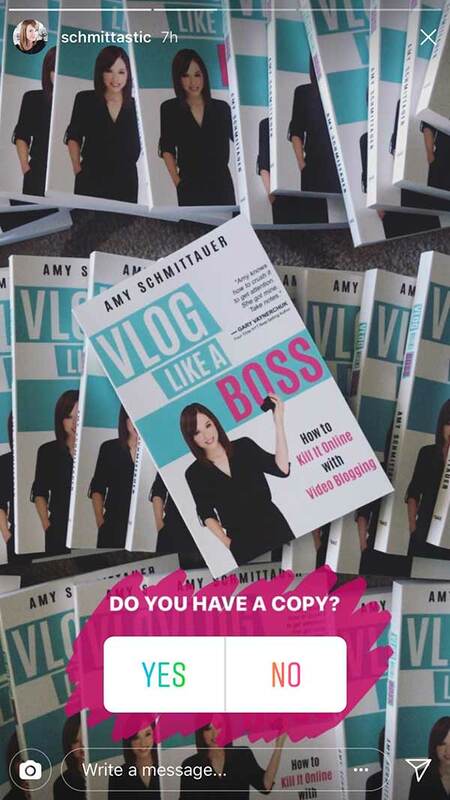 Feature a business you work with – is there a business that you work with regularly that is also on Instagram that you could do a story takeover with? It could be a supplier or someone in the same industry, even a competitor (help to build each other up). The idea is that your audiences will benefit from finding out about the other’s business. Set the guidelines. Discuss what type of content will be suitable, with the person or brand doing the takeover. This includes the type of medium (ie video, photos), the topic, whether there will be any polls added, or any questions you want them to answer. Involve them with the Engagement – Even if it isn’t recorded live at your office, you can send questions for them to be answered or share any engagement via screenshot. Find a way for the person doing the takeover to engage with your audience even if it is you that is posting their content. HOT TIP: Try to partner up with a business that has at least as many followers as you. Share Fan Photos – ask your community to share under a specific hashtag and feature them with permission. Visit San Diego do this well with their Fan Photo Friday on Instagram Stories. Make Your Stories Stand out with these HOT Templates! The guys at Easil (one of my favourite tools for creating visuals) have created a whole series of templates and I think you will LOVE them. There are 12 templates to try now (and even more in their library). They have templates for Behind the Scenes, Instagram Story Takeover, Fan Photos, Breaking News, Hot Tips and More! You can check them out by clicking the image below. * not sponsored, I just love Easil’s templates and asked to share them. Are you using Instagram Stories for Business? Who are your favourite accounts to follow on Instagram for Instagram Stories?